Closure originally started life as a flash game, and while the simplicity of the original’s presentation does not follow through with its PSN counterpart, the proof of concept is still there. While traditional narrative is lacking completely in Closure there is some semblance of a story to be had. You play as a spider-like character, reminiscent in design to something you would find in the Nightmare Before Christmas. A great deal of this game seems to embody Tim Burton’s jagged light and dark art style. If there is no light in a part of a level you will just fall through. Yet unscalable walls when shined on with spotlights or manipulated with gems of light, can become platforms. They can even become elevators if the gems are put in holders. The game is very abstract from art style to even the limitations of your character. I often made some of the earlier levels quite more difficult than they needed to be just because I wasn’t sure the rules involved. When I finally found the solution I didn’t make feel bright when I found the solution, only relieved. Now, you could easily consider this game to have more ambiguous interpretations then say Braid or Limbo. There is something here about the struggle between life and death with the spider creature and struggling comatose children who have to deal with the light of life and the darkness of death. The Spider-like creature takes pieces of memories in the hub world to advance to a larger section of levels. 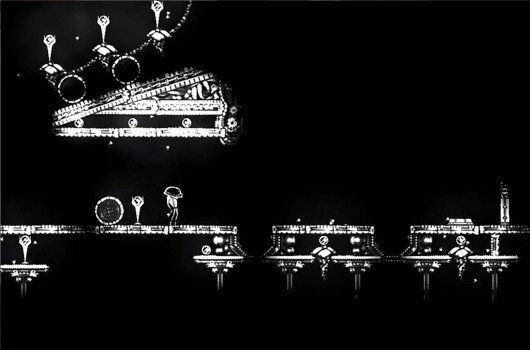 You primarily play the levels as three children all with their own vague stories Now none of that just like Limbo is explained to you in language but with intense imagery.While the story is an interesting insight into how you can convey a great plot with such minimalist endeavors, the puzzles are what keep you there for awhile. While the art style is very reminiscent of Limbo, however its have much more in common with the likes of Braid. You fail a level you start at the beginning of that level, no checkpoints here.The puzzles require set up to get all the variables working . There's the possibility of collecting moths but this is mostly about end game content and replay-ability. The game’s light mechanics are the only way of really losing the game when either your character falls off the level, the key to a door, or a barrel. There are no antagonists which gives you time to think and practice.If there is no light in a part of a level you will just fall through. Yet unscalable walls when shined on with spotlights or manipulated with gems of light, can become platforms. They can even become elevators if the gems are put in holders. The game is very abstract from art style to even the limitations of your character. I often made some of the earlier levels quite more difficult than they needed to be just because I wasn’t sure the rules involved. When I finally found the solution to a puzzle I didn't feel bright when I found the solution, only relieved. What I found most interesting about the game is the parts that it shares with Portal. The pacing is very similar, teaching you to prepare for levels using the same mechanics in the early stages without making the early stages without early stages too easy or a brick wall of frustration. When playing as the teenaged girl you had a few flowers that you had to shine on in order to open the door, this is then used later on as eight that need to be lit in a certain order and simultaneously without falling off the level. Closure is definitely a game worth playing. It might not be the most original game on the market but it makes up for it with using its core concepts as well as offering interesting story beats.If I had any real complaints about Closure it would have to be of the sound design. It is not terrible, just repetitive. The first level dealing with the mining child was annoying and there was not enough variation with the three songs. It improves once you get past the first set of levels but I still chose to turn the music off occasionally in the game. +The puzzles and presentation take everything from the greats of before and add their own ideas as well. This game was played to completion by the reviewer using a copy provided by developer Eyebrow Interactive.